Are you tired of scrolling through the Facebook newsfeed and Pinterest front page, feeling more and more like a failure at motherhood? Have playdates become torture as you learn from other mothers yet another thing good mothers simply MUST be doing? Do you wince as you set the store-bought cupcakes you swore you’d never purchase next to another mom’s fancy homemade cookies on the Bible study snack table? If so, you might find Ashworth and Nobile’s I was a Really Good Mom before I had Kids a helpful perspective-check. When I first picked up this book, I figured it must be a memoir, full of stories of a mother failing to live up to her expectations. Alas, a memoir it is not – but despite not being what I expected, I enjoyed and appreciated this book. Ashworth and Nobile found for themselves that motherhood wasn’t at all what they expected, and got tired of feeling so… defeated … as mothers. They didn’t feel at all the happy, perfect, “good” moms that every other woman seemed to be. They wondered if they were the only ones who felt this way – and they set out to find out the truth about those other mothers. They interviewed hundreds of mothers and discovered that they weren’t the only women who felt like failures as mothers. They discovered that more mothers than not “love their children, but not being mothers” – and they set out to write a book to help women learn to love motherhood as much as they love their children. The book goes through a series of steps to help moms do just that: align their expectations with reality, make peace with their choices, lose the judgment, let go of the guilt, communicate with their husbands, take time for themselves, learn to say no, and live in the moment. Each step has its own chapter, which begins with a tongue in cheek quiz, such as the one that asks you to “rank these questions in order of bitchiness” and offers “That’s so cute – he has Spider-Man shoes and a Spider-Man lunch box. Does he watch a lot of TV?” as one of the options. After each chapter, the authors offer several action items to help mothers work on the topic broached by that chapter. While the general concept of this book is not new (there are certainly dozens if not hundreds of books and articles and blog posts on the same subject), I feel like the authors did a good job at creating balance within their book. It seems to me that articles I’ve read in this category tend to fall into two different camps: the you’ve-got-to-take-care-of-yourself camp and the you’ve-got-to-lose-yourself-in-your-child camp. The you’ve-got-to-take-care-of-yourself camp elaborates a series of self-care rituals that mothers ought to engage in so as not to become bitter over motherhood. Mothers should take time to go to the spa to get a massage or their nails done. They should work out daily. They should eat healthy. These articles tell moms that they need to do these things for themselves – and for their kids. Because a mom who doesn’t take care of herself isn’t good for her kids. 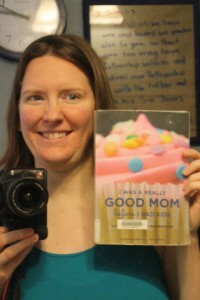 The authors of this book discuss the need for mothers to take time for themselves (and for the same reason), but instead of giving another list of things mothers ought to do (and therefore feel like failures for not doing), they encourage mothers to think through and find out what things make them into “a person they enjoy being with”. The authors acknowledge that motherhood may change the things that women find enjoyable – and that’s OKAY. Maybe crafts used to energize you, but now facing the prospect of cleaning up after crafting makes you cringe. Maybe you used to think seeing movies in a theatre was pointless – but now the thought of being able to be in a dark room with no one talking to you is your idea of bliss. That’s OKAY. The important thing is finding out what makes you tick where you’re at now, and finding some way of incorporating that into your life. In short, I highly recommend this book to mothers who feel overwhelmed by the task of mothering. While I’ve not yet dealt with many of the frustrations discussed in this title, I’ve certainly discovered the need to adjust my expectations since becoming a mother. As a short caveat, this book is not written from a Christian perspective and there is some inappropriate language found within. Additionally, while the authors do a decent job of encouraging women to understand their husbands’ perspectives in parenting and to communicate well with their husbands, some of the quotes from the women they interviewed convey highly unhealthy attitudes towards husbands. Synopsis: The authors encourage moms to learn to enjoy motherhood by letting go of unrealistic expectations and developing healthy attitudes and behaviors for mothering. Recommendation: Recommended to mothers who are struggling with mommy guilt, fighting in the mommy wars (or wishing they could get out of the crossfire), or who are just plain overwhelmed by mothering.